Frank Nichols learned how to tell time from his 2nd grade teacher at Will Rogers Elementary in Stillwater, Oklahoma. The teacher instructed the class on the hour hand and then, while beginning to discuss the minute hand, mentioned that you really didn't need the minute hand since you could tell time just from the hour hand (when the hour hand is between the 1 and the 2, you know it must be 1:30). Frank, with his logical and rational mind, wondered to himself, as a 7 year old kid - If we don't need the minute hand, then why is it there? That enigma stuck with him for years. He was later influenced by factory and automobile dashboard gauges that are precise and have only one hand and also by the produce scale at grocery stores that have a dial scale of numbers and one hand that rotates around that scale. For years, Frank wrestled with this concept of a watch with only the hour hand. According to Frank, we are too hung up on the exact minute when we tell time. When someone asks us what time it is, we usually respond with a generality - "It's about 3:15" or "ten minutes to seven." Frank also is a logical and rational minimalist - why two or three hands on a watch when one will do. He named the watch Time Gauge, based on his desire to reflect the watch as a precision instrument and reflect the basic functionality of what a watch (or clock) is supposed to do - help the user gauge time. "Instead of having two hands, one that calls attention to passing time by racing around the face and lapping the other; this watch has only an hour hand." 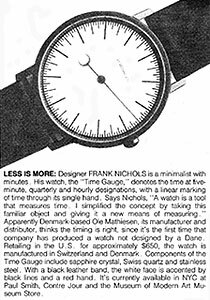 Frank adds, "A watch is a tool that measures time. 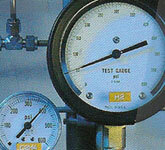 I simplified the concept by taking this familiar object and giving it a new means of measuring." 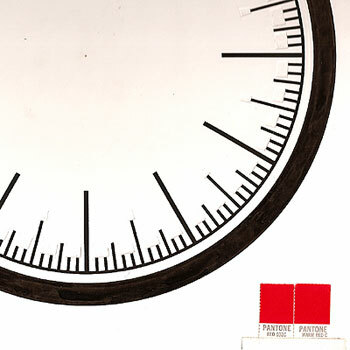 Frank's production mechanical: The original inked board for the dial ticks with the Pantone color chips for the red hand. A tissue overlay for the design of the hand. By 1987, two years after moving to New York City, he met with the store buyer for the Design Store at the Museum of Modern Art. He showed her his concept for a one-hand watch and for his wood pencils that won't roll off your desk (another great story and product). She was intrigued. 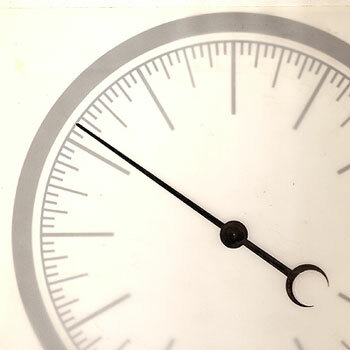 While reluctant to get into the watch business, she did connect Frank to a watchmaker in Copenhagen that she had worked with, Ole Mathieson. They corresponded and worked out the details of design. It was constructed a sapphire crystal, Swiss quartz, stainless steel, and a black leather band. 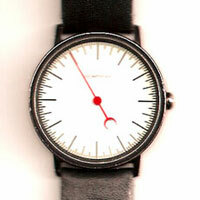 Frank's Time Gauge watch was introduced at the MoMA Design Store in 1989. It received quite a bit of publicity: Frank's girlfriend worked at a major PR firm and it was promoted by the sales rep for the Danish watchmaker. She was instrumental in getting additional publicity and positioning the watch in catalogs and other outlets. It retailed for $525-$650. Almost 200 watches were made and sold. It was packaged in a black box in keeping with a trend in the late 1980s of using lots of black. 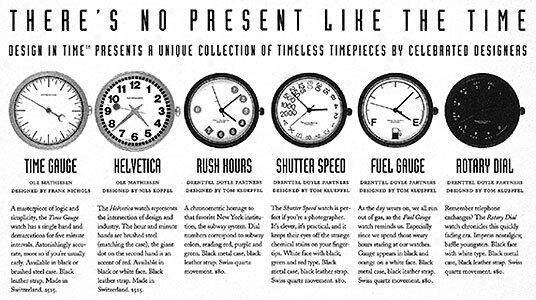 Some of the many pieces promoting the new Time Gauge watch in 1988. 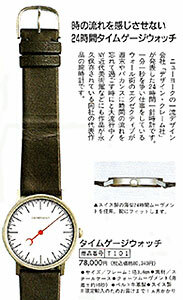 I saw a blurb about the watch in Metropolis magazine in the winter of 1989. There was a brief caption and a full-color photograph. I read it, agreed with the concept, and told myself, "I will own that watch some day." It was expensive so I thought I'd wait and maybe the price would come down. A few months later, I was in New York City with students on a Study Tour. We were at MoMA and I went into the design store. At that time the products were sold downstairs below the books. As I turned to go back upstairs, I saw the watch on display in the case with other watches, pens, jewelry, etc. I asked to look at it. It was even more impressive in person. What the hell - I decided to buy it. I started to go upstairs to join the museum since I would save money on the watch with a member's discount. The store clerk told me not to bother - he would sell it to me at the member's price since it was the last one they had and it had been the demo model. Great. I bought it and wore it out of the store. I couldn't tell time on the dang thing just yet so I had to practice reading it at a glance (now it feels awkward to look at a watch with more hands on it). I had no idea who had designed the watch. I knew it was from Europe and it had been written about in design magazines, but I knew nothing of the designer. Years later, 1999 or early 2000, a friend (who had seen and admired my watch) was in line to see a movie in Oklahoma City and saw the Time Gauge watch on a guy in front of him. He casually mentioned to that person that he had seen that watch before (on me). That person turned around and said that he designed the watch. It was Frank Nichols. My friend got his contact information and gave it to me. I contacted Frank to see if he would speak to our design majors on the next NY study tour. He was willing. He has spoken to every group since. He has a brilliant inventive mind and I like his sharing with students his inspirations, thoughts, and how he sees possibilities. The Egyptians had ten hours of daylight from sunrise to sunset (exemplified by a sundial described in 1300BCE), two hours of twilight, and twelve hours of night. The calendar year was divided into 36 decans, each ten days long, plus five extra days, for a 365-day year. Each decan corresponded to a third of a zodiacal sign and was represented by a decanal constellation. In the summer sky the night corresponded to about twelve decans, although half a day would correspond to eighteen decans. This led to the division of the night into twelve hours. The first hours were seasonal in that their length varied with the season. (Note that this system was also used in oriental clocks.) Later, Hellenistic astronomers introduced equinoctal hours of equal length. The Babylonians (about 300-100BCE) did their astronomical calculations in the sexagesimal (base-60) system. This was extremely convenient for simplifying division, since 60 is divisible by 2, 3, 4, 5, 6, and 10. The first fractional sexagesimal place we now call a minute, the second place, a second. Until 1883, the entire country operated on a chaotic system of varying local times determined by the position of the sun. Authorities in each city would signal the time by which people would set their clocks and watches. Local time varied by a minute or more from one side of New York City to the other. When it was 12noon in New York, it was 12:12 in Boston, 11:56 in Philadelphia, and 11:30 in Cleveland. These differences were caused by the fact that the sun rises at different times in each city. Although people adapted to the local time method, it was disorganized, confusing, and dangerous for the various railroad systems in America, which lobbied for a national standard system. 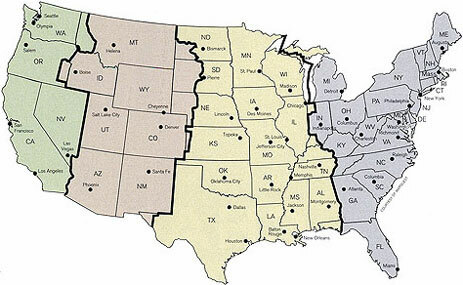 A plan for geographic time zones was adopted by the railroads on October 11, 1883 and implemented on Sunday, November 18, 1883 which became known as "The Day with two noons" since there was a noon based on the sun and a second noon based on the new Standard Time. The Prime Meridian Conference, officially called by US President Chester Alan Arthur in October of 1884, ushered in world standard time. Representatives from 25 nations met in Washington, DC and recognized the need for a time standard in a world of increasing speed in both communication and travel, with its implications for commerce. 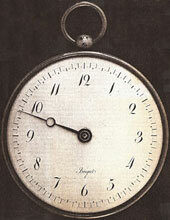 The Standard Time Act of 1918 was enacted into law in the United States on March 19th, only eighty-five years ago. The world was divided into twenty-four time zones, with each day beginning at midnight on the Greenwich prime meridian. The word clock is from the Latin word clocca, bell - it was the sound of bells that denoted the passing of time. The word watch is very old - from the Germanic word wakojan, meaning "to not sleep, to be alert". Wakojan eventually produced two modern English words: watch and wake. The fact that these two words are siblings can be seen from the modern use of wake in its old watch sense to mean 'watch over a dead body'. No one at a wake really expects the guest of honor to wake up. The idea of assigning someone whose specific task was to keep an eye on things led to the sense of 'watch' as in watchman. And since one person could not reasonably be expected to remain watchful around the clock, the division of the day into periods called watches soon followed. The wristwatch kind of watch developed about 1440, and actually harks back to the earlier 'be alert, not sleep' meaning of watch. The first watches were probably fairly primitive alarm clocks, whose purpose was, then as now, to wake us up. In 1524, Peter Henlein created the first pocket watch. It is rumored that Henry VIII had a pocket clock which he kept on a chain around his neck. However, these watches only had an hour hand - a minute hand would have been useless because of the inaccuracy of the watch mechanism. Eventually, miniaturization of these spring-based designs allowed for accurate portable timepieces (marine chronometers) which worked well even at sea. 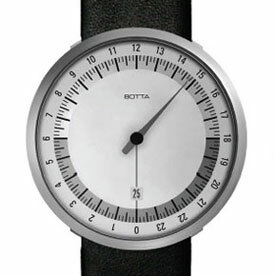 Others had produced one-handed watches, but none captured the volume sales that more specific watches/swatches did. 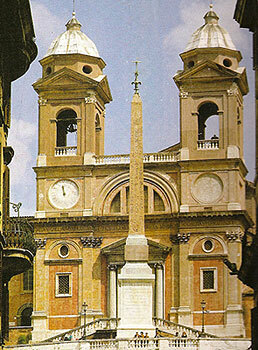 The clock on the cathedral at the top of the Spanish Steps in Rome. Far right: A watch from Uno with all 24 hours on the face and gradations for day and night.